When you’re looking for a healthy snack around the home popcorn might not be the first food to spring to mind. But, in recent years, home popcorn makers are certainly wearing the kitchen appliance crown. They are able to produce popcorn in minutes and most are virtually maintenance free. Not only that but they can make your snack as saintly or sinful as you please because you can add lashings of butter and flavourings or simply have them with a dusting of salt – and everything else in between. So, if you’re in the market for a popcorn maker, read on as we dissect this kitchen appliance in our ultimate guide to popcorn makers. Whether you are sitting in front of a screen, hosting a party, hanging out with friends, or simply craving a snack, popcorn is always a welcome treat. 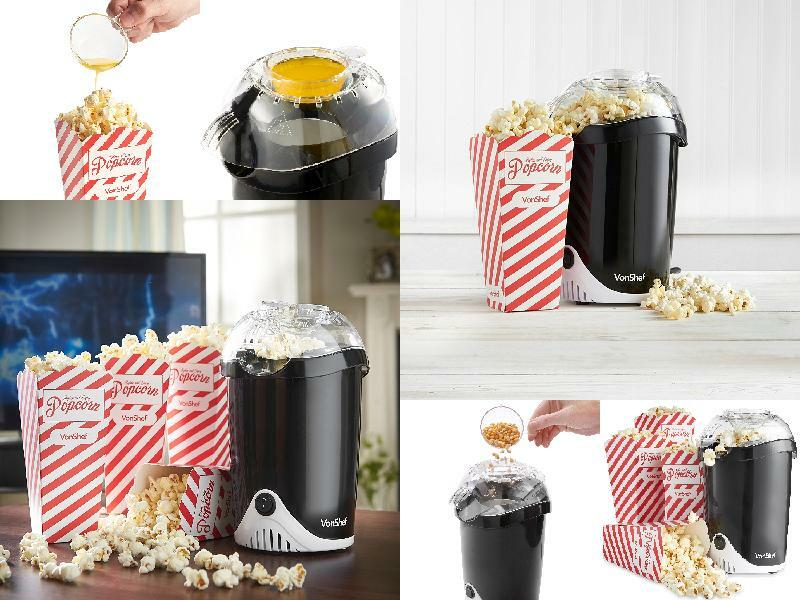 And the VonShef Fat-Free Hot Air Popcorn Maker lets you enjoy the very best of popcorn without having to head down to your local cinema. Easy to use, fast, versatile, and even healthy. This popcorn popper provides the reliable and simple use we’ve come to expect from Vonshef after testing some of their other appliances such as their best selling milk frother. We’ll take you through its features to help you decide whether this appliance could be right for you. If you are a bit of a health nut, the VonShef fat-free popcorn maker is just perfect. This appliance does not required hot oil to cook popcorn. Instead, it heats up air and circulates it to pop the kernels. As a result, the appliance delivers popcorn that is fat-free and rich in fibre. This means you can munch away a generous serving without any guilt. What’s more, you could add an extra dose of healthy goodness to your snack by tossing in healthier flavourings like spices and herbs. But, what if you have a sweet tooth or like your popcorn chock-full of flavours? Well, this appliance has something for you as well. Its lid also serves as a butter-melting cup. You can use it to drizzle melted butter or cheese over popcorn after serving, or add whatever flavours you desire (sugar, salt, chocolate, maple syrup, etc). Although the VonShef popcorn maker does not have handles, its housing is designed to stay cool to the touch. Therefore, it is safe to hold the appliance when adding flavourings or emptying popcorn. Another impressive feature of this VonShef popcorn maker is that it cooks very fast. It takes about 30 seconds for kernels to start popping and another minute for the popcorn to be ready. When you’re want fresh popcorn you just need to drop in a scoopful of kernels using the provided measuring spoon, turn on the appliance (by pressing the only available button), place the lid on, add flavourings to the butter-melting cup, and sit back as the popcorn maker does its work. 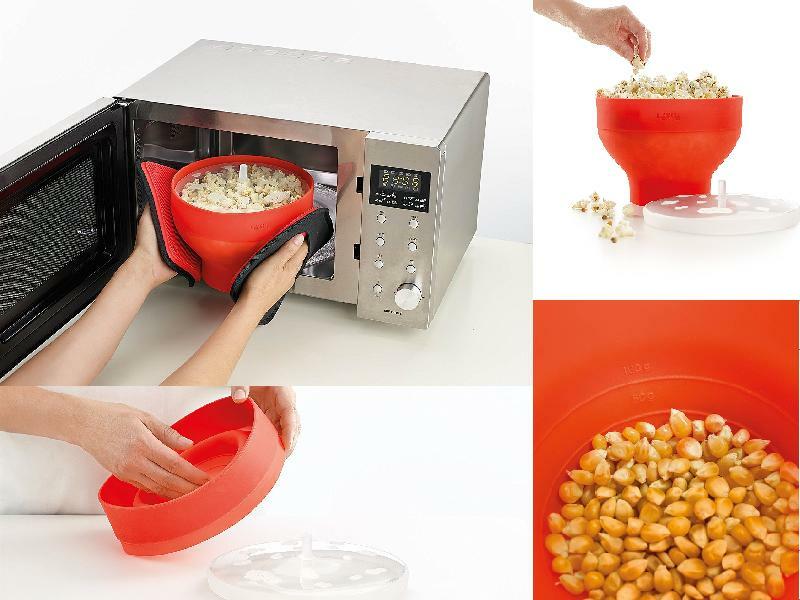 The popcorn maker is designed to throw out cooked popcorn through an opening at the lid. So, make sure to have a popcorn box or large bowl under the dispenser slot ready to receive your treat. Flavours should be added after you have taken out the popcorn from the machine since adding anything else during the cooking cycle would cause ingredients to stick inside the appliance. As for maintenance, quick cleaning of the popcorn maker’s interior and lid/melting cup after each use is all that is required. 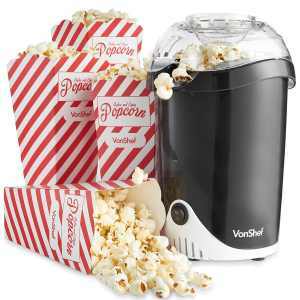 With its ability to make 2 servings in one go, the VonShef Fat-Free Hot Air Popcorn Maker will fit right into any home. At the time of writing this review, it was retailing for just under £30, making it a very reasonably priced. What’s more, the manufacturer offers a 2-year warranty, which means you can buy with confidence. Nothing adds charm to movie nights than entertaining everyone with a large bowl of popcorn while watching a great film. And, you don’t have to serve stale, store-bought popcorn that will end up ruining the whole movie-watching experience. There are many pop-corn makers on the market these days for domestic use that allow you to prepare fresh, crunchy and delicious homemade popcorn. However, only a few match the convenience you will get from the 300W Retro Style model from Andrew James. Larger than the Andrew James Classic Retro Hot Air popcorn maker, this specific model is a perfect family-size unit. It comes bundled with free accessories and at a very affordable price. Read our full Andrew James popcorn maker machine review of the 300W Retro-Style model to find out what it has in store for you. Unlike the Andrew James Classic Retro (which you will also find reviewed in this guide), the larger 300W Retro Style hot air unit that comes with 4 re-usable serving buckets features a transparent case. The transparent case lets you keep an eye on popcorn as it cooks and there is even an internal light to improve visibility. This eliminates the need to time the cooking duration manually. Kids can watch the popping action to their delight, which serves as a source of entertainment for them while you prepare your movie snack. The 300W Retro features a 2.5oz stainless steel popping kettle that attaches to the roof inside the case where all heating elements are located. Spinning arms inside the kettle stir up kernels to ensure your corn comes out evenly cooked. A nifty featured added to the kettle is a tilting arm found outside the case. This arm lets you tip the centrepiece to pour ready popcorn into the collection tray beneath the kettle and create more room to cook another batch. As its name implies, this popcorn maker has a retro design that reflects the old golden age of cinema. 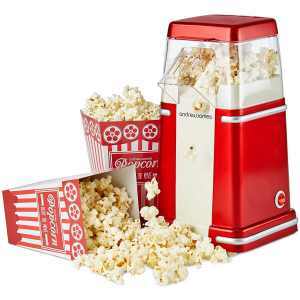 With its nostalgic red and white retro colours, this popcorn maker is sure to be a hit and great centrepiece at any party. Its stylish design would also add to be at home in any kitchen. Operating the 300W retro-style is very easy. It turns on when you flip the ‘on/off’ red switch found on the upper front section. A similar switch turns the internal light on or off. The machine has to be preheated for 3-5 minutes before you attempt to cook the first batch. It is advisable to wear oven gloves to prevent burning incidents since the popping kettle and hot air circulation heating elements tend to get very hot. Once the machine finishes preheating, turn it off before adding popcorn kernels to the popping kettle. You can create 1 gallon of popcorn in 4-5 minutes by following these simple steps. Release the door handle of the popcorn maker to access the machine’s interior. While holding the kettle’s plastic handle, lift the cover flap up and add a small spoonful of vegetable oil or flavouring ingredients (optional) to the popping kettle. Turn the machine back on and lock the door. The kernels will all pop within 4-5 minutes and you can monitor the cooking progress. Once the popping stops, turn the machine off and tip the centrepiece to collect cooked popcorn in the tray below. To prepare another batch, repeat steps 1-5. Empty the collection tray when it’s full by adding ready popcorn to the serving buckets that come with the machine. This popcorn maker makes light work of cleaning thanks to its stainless steel popping kettle. The kettle comes off the attachment brackets, allowing you to remove it from the popcorn maker and clean up with ease. Any oils also come off easily when washed with soapy water and rinsed under tap water since the kettle interior has a non-stick coating. However, make sure to use a nonabrasive sponge to avoid scratching this part. To clean the machine’s insides, simply wipe with a damp cloth. The popcorn maker emits smoke and a slight odour during the first few times of usage. However, this will stop once the chemical residues used during the manufacturing process burn off the appliance. If you are looking for a large capacity popcorn making machine, then the 300W retro-style model from Andrew James is a keeper. Despite having a 2.5-ounce kettle, this appliance churns out one gallon of popcorn per batch. You can run multiple cycles and fill up the collection tray below it to fill the large serving buckets it comes with and serve more than one person. It only takes 5 minutes to cook one batch, allowing you to prepare a sizable serving of popcorn for the entire family or group of guests. The fact that this appliance comes with a 2-year manufacturers warranty is another reason why it’s worth considering if you are looking for a quality popcorn maker from a trusted brand. 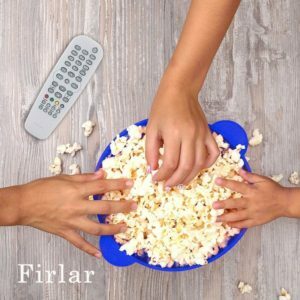 Although a microwave popcorn maker is not something most people would go for, this popcorn maker by Firlar could make you think twice. 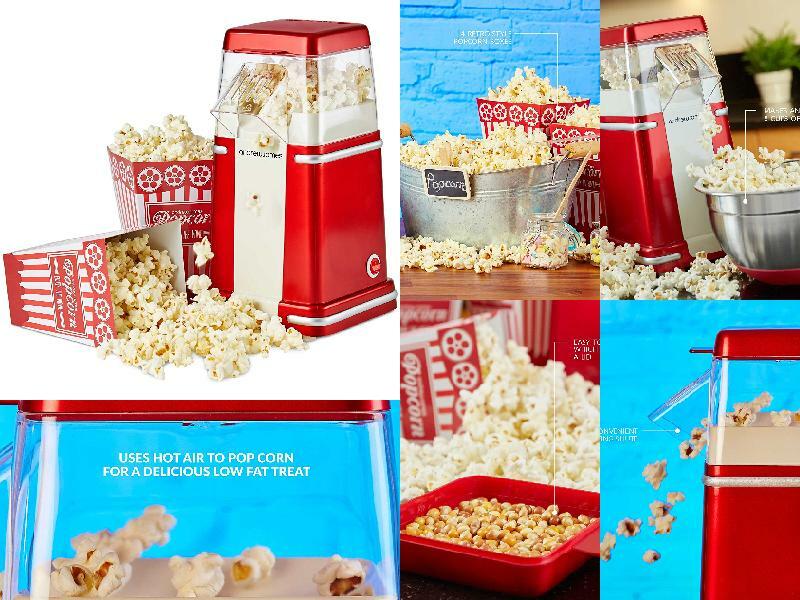 Despite being designed for use in a microwave, it makes popcorn just as well as an actual popcorn machine and even better than those models which do not allow for seasoning. To top it up, it comes with a few handy features that make for a very easy time when making popcorn. 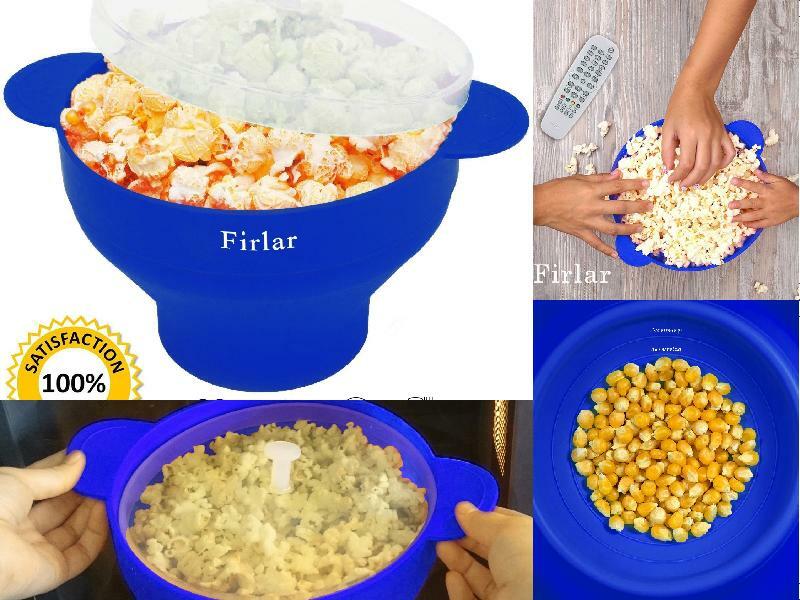 Here is a quick look at what the Firlar Microwave Popcorn Popper has to offer. With this utensil, you will never have to worry about measuring out your kernels. The bowl has built-in measurements that are clearly labelled as ‘one serving’ and ‘two servings’. The measurements are also etched into the bowl, thereby ensuring you always have a reliable guide when adding your kernels even when the labels fade away with time. The handles on either side of the bowl offer much convenience when it comes to handling the popper. These eliminate the need for hot pads allowing you to simply reach into the microwave and pull out your bowl of hot popcorn with your bare hands. The handles also allow you to easily toss around ingredients (flavourings, kernels, and popped popcorn) in the bowl when seasoning. This popper is designed to collapse into 2 separate parts, which ensures storage and cleanup is easy. Using the popper is as simple as placing your kernels in the bottom bowl to your desired measurement, covering with a lid, and tossing the bowl into the microwave. However, there are a few tricks to ensuring you end up with the best-tasting popcorn. 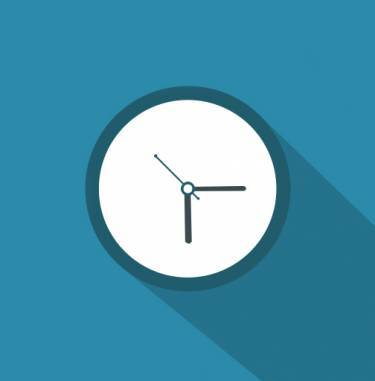 Since the recommended cook time is 2-4minutes (depending on microwave power), it is advisable to set your microwave to the maximum recommended time. This will ensure you give the popcorn popper enough time to pop all kernels. Monitor the kernels as they pop and turn off your microwave the minute you stop hearing popping sounds. This will help ensure your popcorn does not burn. Oil, salt, and other flavours set best when added along with kernels. So, thoroughly mix kernels with whatever seasoning or flavouring you choose to add before tossing the bowl into the microwave. The bowl is made of a nonporous, high-quality silicone material that does not allow dirt, bacteria, and other microbes to stick to it. This coupled with the collapsible design makes the popper is super easy to clean. If you are looking for a cheap but good quality kernel popper, this utensil is worth considering. This appliance does what it is built for and delivers great tasting popcorn. Aside from that, all available features are geared towards ensuring you have an easy time using, cleaning, and storing. Hot air popcorn makers are all the rage these days as more and more people look for appliances that cook fat and sugar-free snacks. 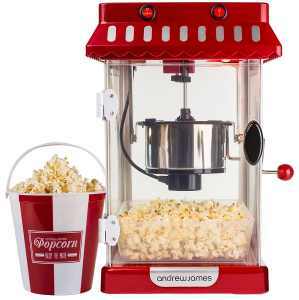 The Andrew James Classic Retro Hot Air popcorn maker fits into this category of appliances but it has plenty to offer other than a healthy movie treat. Get the full details of its features and specifications in our comprehensive review below. 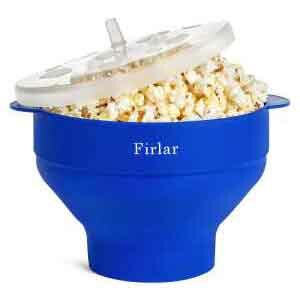 Multipurpose lids have become quite common with many popcorn making machines. This retro-themed unit from Andrew James follows the same trend thanks to its removable lid/kernel scooper. Scooping kernels with the lid is easy because you get to hold the spout that acts as a popcorn dispenser when the lid inverts to cover the machine. The dual function that the lid plays reduces the need for an extra accessory, which means this machine takes up a bit less counter space in your kitchen. There is no need to add snack bowls to your shopping list if you buy this popcorn maker. It comes with four cardboard boxes for serving popcorn. The print work on popcorn boxes complements the machine’s retro-theme, which brings a little taste of the cinema into your home. This appliance is very simple to operate, having only an on/off switch. You just need to add some kernels into the machine’s kettle and turn it on. The machine blows hot air inside the cooking chamber to cook a nice bowl of freshly, popped corn within minutes. 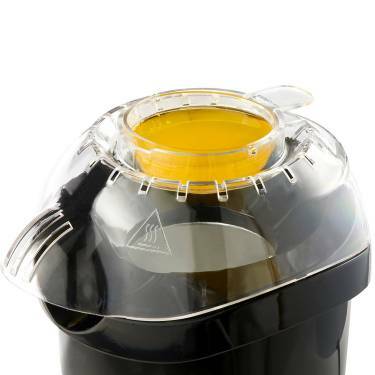 Since this popcorn maker does not use oil, you don’t have to worry about washing greasy parts. Only cooks one cup of popcorn at a time. 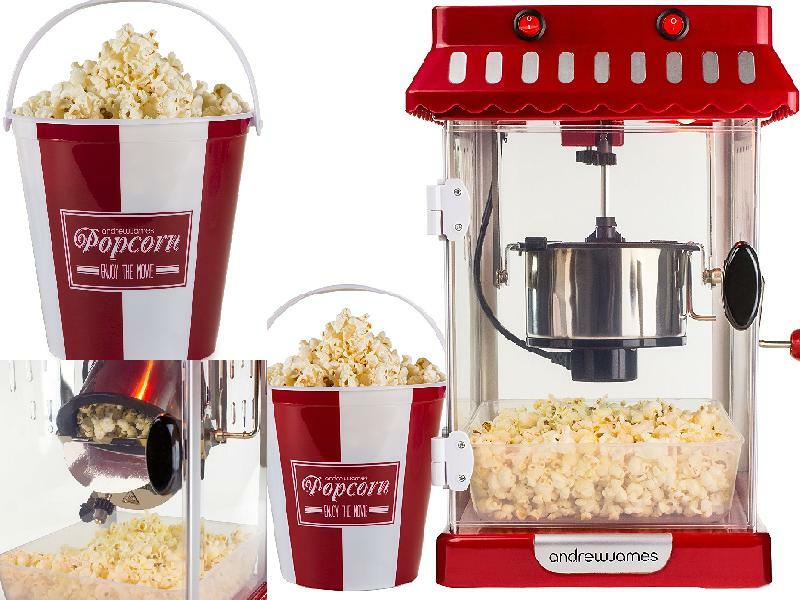 Despite its low capacity, the Andrew James Retro Hot Air popcorn maker offers good value considering its low price range and quality construction. If you are on a tight budget but want a popcorn-making machine that can get the job done, this unit should definitely a top contender. 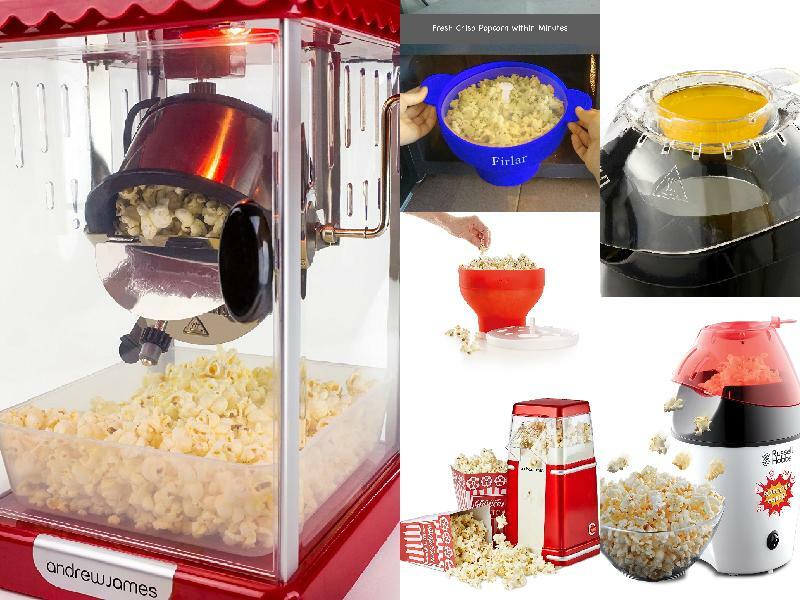 Do you love popcorn but do not have room in your kitchen for another appliance? If so, the Lekue 1-piece popcorn maker could just be what you need. It goes into your microwave when popping corn kernels and into the cabinets when not in use. At first glance, this appliance does not look like much. The container will even bend in on itself sending popcorn flying to the ground when you attempt to remove it from the microwave using just one hand. However, this build is actually one of the best features of the popcorn maker. Made from high-quality platinum silicone, the bowl has the ability to withstand temperature extremes without getting damaged. The bowl also has amazing tensile and tear strength, making it perfect for the job of making popcorn. It even comes with a 10-year manufacturer’s warranty (for manufacturing defects only), proving just how long-lasting this popcorn popper is designed to be. Going into a popcorn maker, kernels have a 50 – 50 chance of either popping or not. There is just no way of controlling the outcome. However, this amazing popcorn machine is designed to ensure very few kernels go un-popped – in fact its design is capable of popping over 90% of corn kernels. Which is one of highest popping rates available! There is also no need for a measuring cup when using this appliance because it has two measurements (50 & 100 g) marked on the bowl itself. This translates to enough popcorn for up to 3 people in one go when the popcorn maker is used at full capacity. Like most microwave popcorn makers, this on is pretty easy to use. Just add anywhere between 50 – 100 g of kernels (along with oil/butter, salt, and other flavourings) into the bowl, cover, heat in microwave for about 3 minutes or until kernels are no longer popping, and serve in the same bowl. You can also choose to go the healthy way and pop kernels without using oil and fats. When it comes to cleaning, simply wash with water and soap under a tap or throw it in the dishwasher. The lid is also designed to fit loosely over the bowl. So, the lid first sits down in the bowl and slowly rises up as kernels pop. 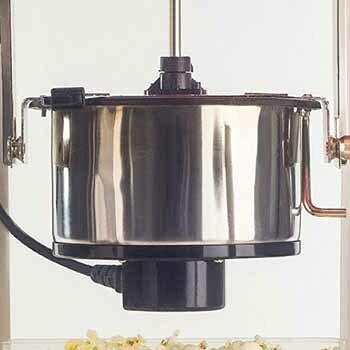 Since the lid floats over the popcorn throughout the entire cook time, it vents out steam, which is great for ensuring nice, puffy and great tasting popcorn. For a plastic bowl, it’s a bit pricey. However, this is understandable given all it has to offer. 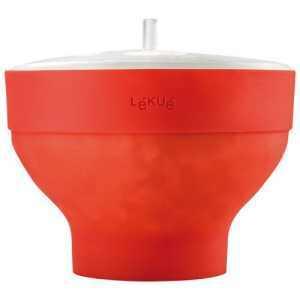 Although the Lekue 1-piece Popcorn Maker is literally just a bowl and lid, it comes with really nice features. Its high-quality build means you can use the popcorn maker for years to make all manner of popcorn recipes including spicy combos like cheese & onion or garlic & onion. And, thanks to the innovative design used, the popcorn maker delivers delicious popcorn with little wastage of kernels. Overall, it is a great choice if you want to make movie nights extra special by serving homemade popcorn without having to invest in a large, space-hogging kitchen appliance. Russell Hobbs is one of Europe’s leading small electrical appliances manufacturers and has been producing high-quality products for decades. So, it is no surprise that this brand is in the popcorn maker industry, which is good news for those who want a kitchen appliance that makes healthy movie snacks. One of their great options is the Russell Hobbs 24630 popcorn maker. Powerful, fast, large, and convenient, this appliance has a lot to offer if you are tired of buying stale, store-bought popcorn. The Russell Hobbs 24630 is designed with a spout that shoots popped kernels out of the machine. This little dispenser is sure to be a favourite feature for kids, and big kids, alike. Adults, in turn, will love the level of convenience that the popcorn machine has to offer. From measuring kernels to popping them, to gathering up popcorn in one area, this machine does it all, leaving you with very little work to do. Standing over 11 inches tall, the Russell Hobbs 24630 is a full-sized popcorn-making machine. Thanks to this size, the machine is able to produce 12 cups of popcorn in one go. This is enough to keep two people going until the unit has cooled down enough to be used again. 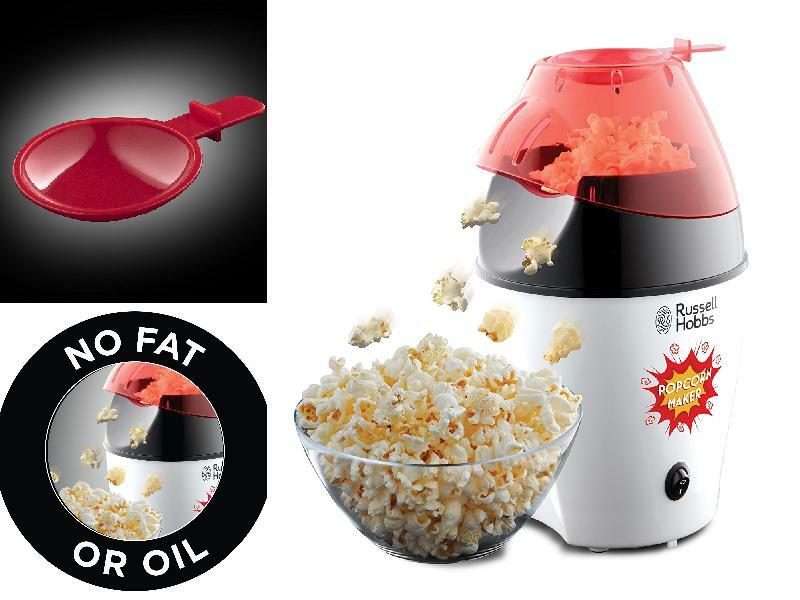 This Russell Hobbs popcorn maker comes with two key benefits of 1) allowing you to make fat-free healthy popcorn and 2) popping kernels in record speed that produce popcorn in minutes! However, there is an extra kick to this popcorn maker. It uses a powerful 1290 W motor. 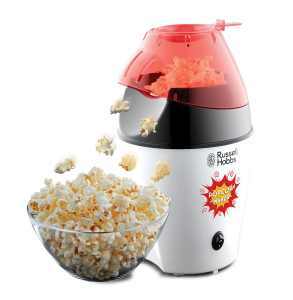 So, while other popcorn makers (including some hot air poppers) pop kernels in 3 to 4 minutes, this Russell Hobbs model will have a batch of popcorn in your bowl in well under 2 minutes. Like any quality popcorn machine, the Russell Hobbs 24630 is designed with user-friendliness in mind. The device comprises of a housing, a removable cap that doubles up as a measuring scoop, and a simple on/off switch. So, to use the appliance, just measure one cup of the kernels using the lid, pour in to the popcorn kettle, and switch on the popper. Pieces of popcorn will start shooting out of the lid’s dispenser sooner that you can imagine, so make sure to have a bowl properly positioned to catch them. Season as desired after all the popcorn has dropped into the bowl. When done using, cleanup is as simple as washing the removable lid in the sink and wiping the rest of the appliance. This is a fun, very easy to use, super fast, and effortless popcorn maker. It is; however, designed for popping kernels in a healthy way. Therefore, if you are someone who prefers the taste that comes from mixing butter and other sugar-rich flavours with popcorn kernels, you may need to look elsewhere. Because whilst you can add these ingredients afterwards it is never quite the same as when the kernels are cooked, and popped, in them. With so many shapes and styles available what you should look out for when you buy? Did you know that the very first commercial popcorn machine consisted of a steam-powered roaster that was modified to produce seasoned popcorn cooked in oil? The machine even came complete with wheels for easy transportation and a mechanical clown for attracting customers. Since then, popcorn machines have undergone major improvements in designs. Modern machines range from hot air poppers, to countertop units, to tabletop vintage-style machines, with the latter ones still using traditional oil kettles to pop kernels. Today’s kernel poppers top the scale when it comes to design. They are compact, portable, and come in all manner of shapes, sizes, and designs such as hot air, stovetop, outdoor, or theatre-style. Unless you live alone and do not entertain a lot, it’s best to pick a machine that produces several cups of popcorn in one go. With options including 4 oz, 6 oz, 8 oz, 12 oz, and 16 oz sizes, popcorn machines are sized according to how many ounces of popcorn servings a machine can produce in one cycle. Generally, one ounce is the recommended serving for 1 person, therefore, 4, 6, & 8-ounce poppers should be ideal for the whole family or when entertaining friends. While large capacity popcorn makers are great if you want to prepare a large batch in one cycle, keep in mind that these units also take up more countertop or cabinet space. Therefore, think about where you will store the appliance or the spot it will sit in your kitchen while in use and check whether its dimensions can fit into the available space. 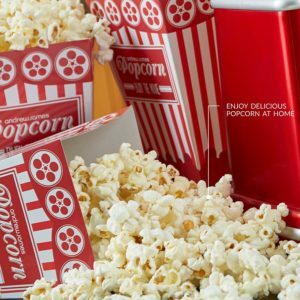 When you’re enjoying a movie night with your family or friends, it is good to have a constant supply of popcorn – if that is the snack of choice. To meet this end, a popcorn popper with fast cooking speeds is ideal. To find out how fast a popcorn making machine is, check its popping cycle (also referred to as cook time) rating. This specification is usually indicated in terms of cooking duration, which can range from 2 to 5 minutes. To avoid the hassle of having to learn complex controls, or being forced to clean a huge mess after you are done using your popcorn maker, its best to pick one that features a simple design. A straightforward control panel and parts that come off for easy cleaning should be enough to ensure the best user experience. However, also look out for features like heatproof handles, easily accessible controls, and containers with measurement marks. Such features make operation easy whenever you fire up your appliance. The last thing anyone wants is to sit down to burnt or half-cooked popcorn. This is why some the best popcorn poppers have a built-in stirring mechanism. It keeps kernels moving as they are popping, ensuring you end up with a perfectly and evenly cooked batch. Any feature that will make using your new popcorn maker easier or improve the overall flavour of the popcorn is definitely worth having. So, make sure to look out for any extra features as you are shopping for a machine. The great thing is that today’s appliances come with all manner of extras. For instance, some units may come with recipe booklets, serving boxes, steam vents that ensure the popcorn comes out dry and crisp, a built-in butter well for enhancing flavour, a slot for adding seasonings, and even cooking bowls that double up as a serving bowl. In addition to the above tips on buying a popcorn maker, it is important that you determine the ideal machine style for you. As mentioned at the beginning of this guide, there are different styles of appliances available. For example, outdoor poppers are designed for use on open fires while stovetop models work best with home cooking appliances like your gas or induction cooker. Theatre-style units are perfect for serving a large group of people while electric hot air poppers are suitable for health-conscious people who want to avoid the extra calories that come from buttered popcorn or those cooked with oil. Our tips on buying a popcorn maker would be incomplete without stressing the importance of choosing a reputable brand such as Vonshef or Andrew James. Popcorn making machines are not created equal. Some manufacturers offer superior products and better customer support than others. So its worth taking this into account before buying. Now that you’re thinking of investing in a popcorn maker (or just bought one), chances are you want to get the most out of your new appliance. And, regardless of how great your popcorn maker is, it will only give as good as it gets. This is why it is important to use the best of popcorn kernels. And, what better way to do this than to ensure your kernels are always fresh and ready to use whenever you need them? Here’s our guide on everything you need about storing popcorn kernels. Have you ever wondered how popcorn kernels turn into the light, crunchy snack we all love so much? It turns out there is actually a science to it. While popcorn kernels may look and feel dry, they are in fact not. They contain starches and water content of about 13.5 to 14 percent. So, when you toss your kernels into a popcorn popper, heat from the appliance causes the water within the seeds to boil and eventually turn into steam. Since steam is denser than water, it puts pressure on the inside of the kernels. This pressure continues to build up until the kernels have no option but to release the pressure. They do this by exploding, which exposes the starches within to air, giving way to popcorn. When it comes to keeping most foods fresh for longer, the logical action many people take is to refrigerate. However, this preservation method is not advisable when it comes to popcorn kernels. First off, popcorn kernels do not technically go bad. They just lose their ability to pop which is exactly what refrigeration will do. The cold in a fridge will cause the water molecules in kernels to freeze and then migrate away from the seeds. This, in turn, will dry up the kernels interfering with their ability to pop and produce fluffy popcorn. The fact that popcorn kernels contain around 14 percent of water is no dumb luck. This is actually the perfect moisture content for ensuring maximum popping. 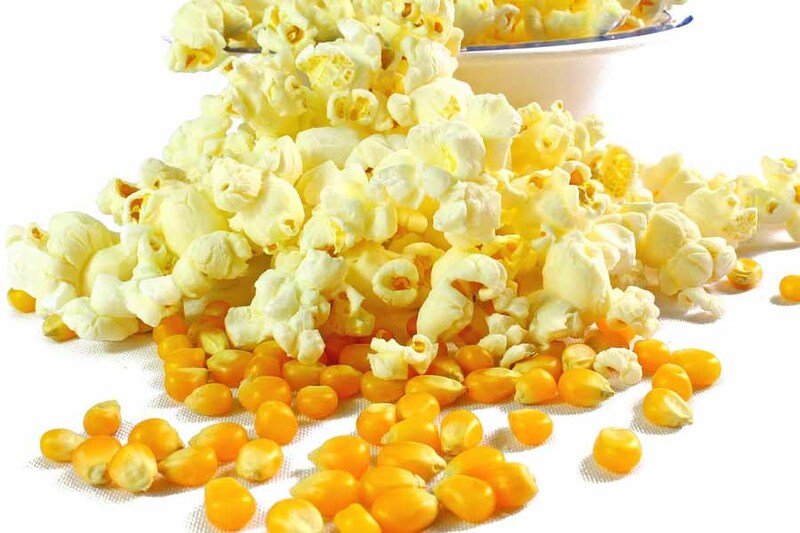 Therefore, when there is excess water inside the kernels, popcorn pops too quickly, forming dense unpalatable spheres. This is why leaving your kernels out in the open whilst cooking is a sure way to ensure disappointment the next time you use them. So, How Should Popcorn Kernels be Stored? As you may have picked up by now, storing popcorn kernels is not about keeping them fresh. You just need to ensure the water within does not increase or escape into the air. Fortunately, there is actually a very simple way of retaining the water content within the kernels – an airtight seal. An airtight container or vacuum sealed food bag will limit exposure to moisture, allowing the kernels to maintain their original water content. And, since air will not be able to get in, you can simply store the container at room temperature in a cool, dry area like a cupboard, shelf, cabinet, or pantry. The good news is that kernels stored in an airtight seal can last at least for at least 2 years or more. If you’ve read this far you should not only have a good idea of what makes popcorn makers tick but also what types might represent the best bang for your buck.